The New York Times bestselling, multiple Eisner Award-winning, and Hugo Award-winning series SAGA continues with the much-anticipated third volume trade paperback, collecting issues 13-18, the entirety of the third story arc and releasing in March 2014. While Marko and Alana travel to an alien world to visit their hero, enemy pursuers remain hot on their trail. Forced to contend with tragedy, complications, running for their lives, and hope, the family at the heart of SAGA is pushed to the limit in this volume. 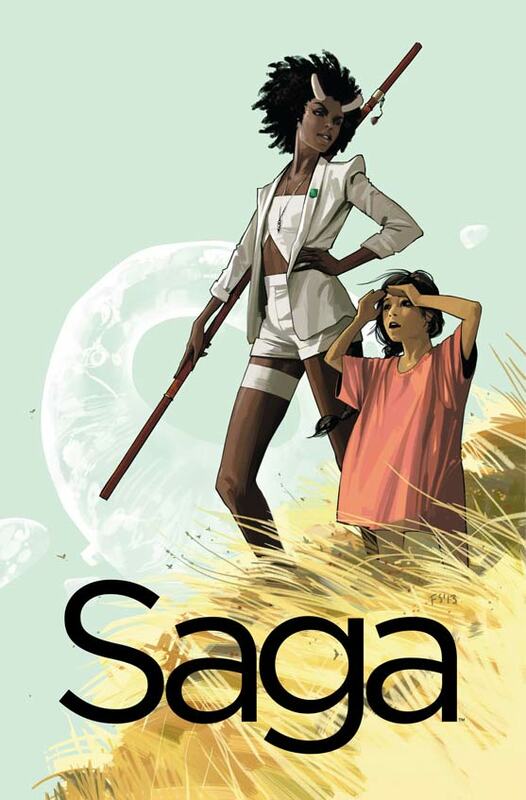 Readers can catch up on the ongoing SAGA series with volume three, which will release on March 19 and is available for pre-order with Diamond Code JAN140556, ISBN: 978-1-60706-931-7. This entry was posted in Columns and tagged Andy Hunsaker, brian k vaughan, comic book resources, Crave Online, Douglas Wolk, Felicia Day, fiona staples, greg mcelhatton, Kelly Thompson, LitReactor, saga, Tim Callahan, TIME Magazine, Tor.com. Bookmark the permalink. Follow any comments here with the RSS feed for this post. Post a comment or leave a trackback: Trackback URL.